On this luxury tour of Africa, travel along the stunning Garden Route. 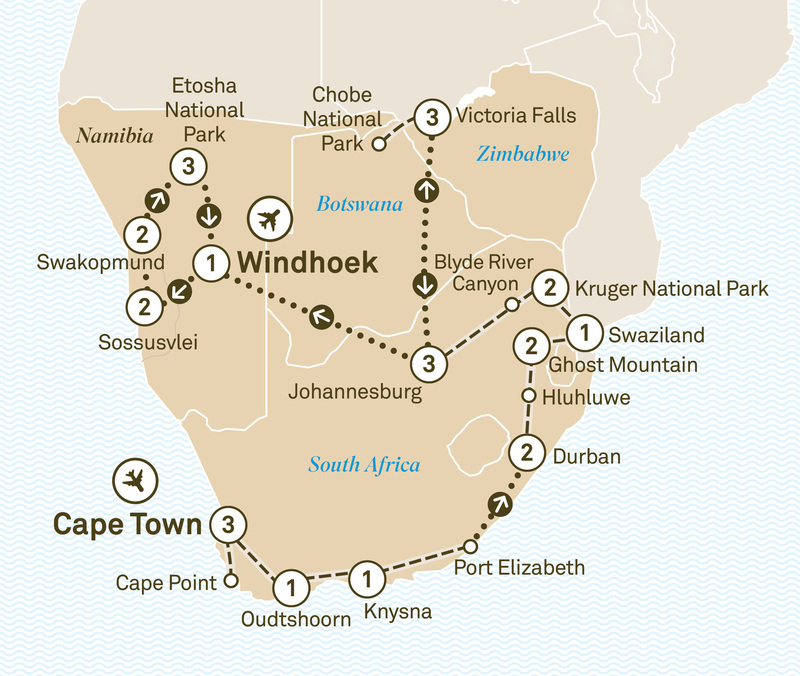 Visit Cape Town, Durban, Ghost Mountain, Kruger National Park & Victoria Falls. It’s impossible to experience all the wonder Africa has to offer in a little over three weeks. However, rest assured, on this itinerary you’ll get to experience everything we can possibly fit in, in a region that has more experiences than a lifetime could uncover. Travel down the length and breadth of South Africa, along the stunning Garden Route, all the way to the green hills of Natal, to Kruger National Park’s Lion Sands Game Reserve, and more. From the roaring splendour of Zimbabwe’s Victoria Falls to the incredible sand dunes of the Sossusvlei Desert in Namibia. This is a journey that encompasses the very best of the continent’s southern and southwestern regions. Welcome to wonderful Cape Town. Enjoy an exclusive three night Special Stay at your hotel, with spectacular views of the waterfront and Table Mountain. Tonight, meet your Tour Director for a welcome drink and dinner. Sample South Africa’s finest vintages on a winelands tour. Alternatively, visit history rich Robben Island, take a township tour, or a Harley DavidsonTM ride. Learn about Africa’s largest bird at a local ostrich farm, then head to Knysna on the Garden Route, famous for its oysters. You’ll enjoy an overnight stay. Enjoy a scenic lagoon cruise with expert commentary on the region’s flora and fauna. Discover today the beach side town of Durban, famous for its Indian and colonial influences. Learn about the Anglo-Zulu war that took place close to Durban whilst sampling afternoon tea. Visit a Zulu community in the Lebombo Mountains, and be welcomed by the village chief for a private tour. Kruger National Park borders stretch an impressive 450 kilometres. You’ll enjoy a two night Special Stay at your lodge, on a private concession within the park. The Sabie River flows through it, home to the highest recorded concentration of leopards in Africa. Look out for the Big Five on a game drive in an open safari vehicle. At the end of your afternoon game drive, partake in one of the most enjoyable of safari traditions – Sundowner drinks. Take in the ambience over dinner at your lodge. Limitless game viewing possibilities await as you traverse the entire Kruger National Park in specially adapted Land Rovers to track the Big Five – lion, leopard, elephant, rhino and buffalo. Encounter hippos by exploring the shores of the Sabie River on foot with a game ranger, or enjoy a fascinating lecture on wildlife. Alternatively, visit a local community. Travel the magnificent Panorama Route on the way to Johannesburg. View Blyde River Canyon, the third deepest in the world, then visit Bourke’s Luck Potholes. Check into your hotel for two nights. Later, you’ll fly to Johannesburg for an overnight stay. Fly to Windhoek, Namibia’s remote capital. Transfer to your hotel a former castle overlooking the city. Soar over open savannah to the Namib Desert, where towering orange sand dunes surround a stunning white salt pan known as Sossusvlei. Surprisingly, this desert wilderness is home to a wide variety of animals, including ostrich, zebra and springbok. For the next two nights, the Little Kulala Lodge will be your home. Meet your local guide for an excursion into the dunes and discover how the ancient bushman scratched a living from this barren land. Take the rare opportunity to climb one of the sand dunes (moderate fitness level required) and witness the incredible vistas across the Namib Desert. Marvel at the sunset in the desert with Sundowners on the deck of the lodge. Fly to Swakopmund, Namibia’s premier resort town and settle in for your two night stay at the Swakopmund Plaza Hotel. Take a seal and dolphin cruise in nearby Walvis Bay, or a living desert tour where your local guide will bring the dunes to life. Etosha National Park is one of Africa’s most unique game reserves. The waterholes around the Etosha Pan attract vast numbers of big game. Enjoy a three night stay at Etosha Village. Enjoy more game drives, including a night drive. Fly to Windhoek, connecting to your onward flight. Please book flights to depart after 6.30pm. Namibia is an independent tour, not escorted by a Scenic Tour Director. Flights within Namibia are via light aircraft.